Address: 248007 Kaluga, pos. Prigorodnoye, Lesnichestvo. National Park Ugra is situated in the Iznoskovsky, Uhnovsky, Dzerzhinsky, Peremyshlsky, Kozelsky and Babyninsky Districts of Kaluzhskaya Region. The Park was founded in 1937. Its area is 98,6 thousand ha. It consists of three sites: Ugorsky, Vorotynsky and Zhizdrinsky. On the south it borders the Zapovednik of "Kaluzhskiye Zaseki". The Park comprises valleys of several of the Oka's tributaries, the Ugra and Zhizdra; and also small site along the left bank of the Oka river itself. Forests occupy more than 65% of the Park's territory, and in some places areas of so-called "zasechnye" forests remain, protected since long ago near the places where "zaseki" — defense constructions against invaders from the steppe — were located. 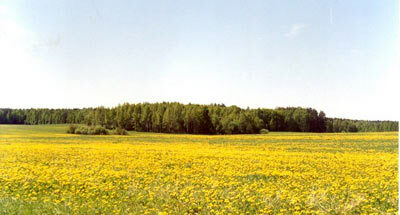 The Ugorsky site goes along the Ugra valley (within Kaluzhskaya Region) until the place where the Ugra reaches the Oka. In the plant cover mixed and coniferous-broad-leaved forests prevail; in the lower current of the Ugra wide inundated meadows are spread. Underground springs are numerous, including mineral water springs — notably the Popovsky Spring and Troitse-Ekaterininskiye Ferrous Springs on the river Techa. 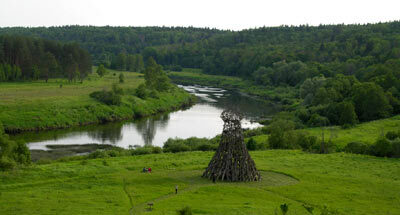 The Zhizdrinsky site occupies the valley of the river Zhizdra from the "Kaluzhskiye Zaseki" Zapovednik" to the river Oka. The inundation zone of the river is wide. Erosion valleys on the right bank of Zhizdra are mostly ploughed. Forests — broad-leaved and birch-aspen with oak — are present in separate isolated pockets. Terraces on the left bank are occupied by pine and spruce-pine. Rich water meadows are developed in the inundation zone. Rare plants are met, particularly caltrop (on lake Gorozhenoye), and also protected species — white water lily, yellow water lily, wild calla, Salvinia natans, and Butomus umbellatus. Lakes in the inundation zones of the rivers are a habitat of a muskrat species inscribed in the Red Data Book of the Russian Federation. In the Park there live elk, wild boar, roe, beaver, and musk beaver. Waterfowl migrate along the Zhizdra each year. The "Chertovo Gorodische" nature monument is interesting — a pile of rocks left by a glacier, where rare plants are noted — microscopic shining moss and relict sweet fern. 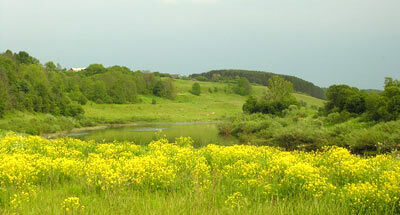 The Vorotynsky site consists of landscapes of the erosion valleys of the Middle-Russia Plateau. 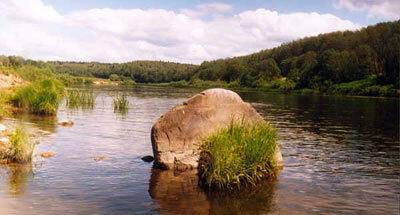 It is bordered by the valley of the river Vyssa and the wide inundation zone of the river Oka. On the Vyssa beaver are met; in the Oka's inundation zone waterfowl are numerous. On the National Park’s territory are located a number of historical-cultural and archeological monuments: stone age settlements, remains of middle-ages towns, ancient graves and memorial houses. Great battles of the periods of the Tatar-Mongolian and Polish-Lithuanian invasions, the war of 1812 and the Great Patriotic War are associated with the Ugra river valley. Near Zhizdra are situated famous orthodox religious centers: the monasteries of Optina Pustyn and Shamordino, associated with the names of Tolstoy and Dostoevsky.